Ferraz Shawmut TR Fuses Are Used For Protecting Motors, Transformers, Service Entrance Equipment, Feeder And Branch Circuits. Ferraz Shawmut TR Fuses are current-limiting time-delay fuses for overcurrent protection in a variety of venues. Time-delay allows safe handling of starting currents and inrush currents. 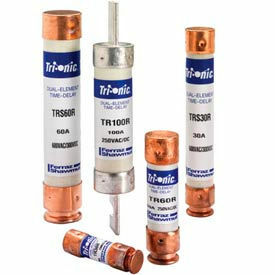 Fuses are non-indicating and are made for indoor use. Available in a variety of lengths. 600V. Amperage ranges from 5 up to 300. Ferraz Shawmut TR Fuses are current-limiting time-delay fuses for overcurrent protection in a variety of venues. Time-delay allows safe handling of starting currents and inrush currents. Fuses are non-indicating and are made for indoor use. Available in a variety of lengths. 250V. Amperage ranges from 1 up to 600.